…it is rare indeed for a pheasant to be shot at distances beyond 40 yards, and rarer still for one to be felled. Most killing shots are less than 30 yards, many less than 25 – even late in the season. Over the course of a dozen hunting seasons I have been conducting autopsies on ring-necked pheasants. While dressing out birds in the field and at the work table, I have tried to evaluate the injuries inflicted by various shotshell loads I commonly shoot during the course of the season. No doubt this obsession seems morbid, but my purpose is well-meant. Game birds should be killed quickly and cleanly on the wing, not wounded and left to suffer a slow death. Motivated by the return of “Sherlock Holmes” on PBS television I have tried to be scientific in making observations, compiling data, and drawing conclusions about the effects of pellet strikes by various types and sizes of shot, loaded to different velocities, and fired at different distances. Since my sampling base is small in number, not much more than 100 birds, I do not contend that the information I have compiled is the final word in what is called “terminal ballistics.” But it has convinced me to make some changes in the custom loads I assemble for pheasant hunting, and it has increased my confidence when shooting in the field with those loads. First, some comments on research methods. My goal was to evaluate shot pellet effectiveness: the number of pellets strikes, the depth of the wound, and the damage that was inflicted. Inspection of the birds was done during field dressing and final cleaning, so data collection was hurried at times. Measurements were taken with the tip of a knife blade, not a graduated probe. Some assumptions had to be made about injuries; during the retrieve a bird dog’s canine teeth may tear tissue and break delicate bones, wounds that can be mistaken for damage caused by shot pellets. Care was taken to correlate shot pellet performance with the distance and angle of the shot that felled each bird. For some of the birds, however, I relied on the “forensic evidence” at the cleaning table to determine the angle of the pellet strikes. Given those caveats, I learned much about shot pellet performance, and some of what I learned will go against the grain of the accepted “facts.” As a general statement, I concluded that even tough, late-season pheasants do not require more than a half-dozen pellet strikes to bring down. But depending on the distance and the angle of the shot, the size and hardness of the shot pellets make a significant difference. Lesson 1: Maximizing pellets strikes is more important than maximizing damage inflicted by any one single pellet. I was surprised to discover than virtually every bird brought to bag had been struck by at least six pellets. Most of the birds had been struck by more, as many as 20. For any given shot charge, the number of pellets that will strike the bird greatly depends on the size of shot. A one-ounce charge of lead shot contains about the following number of pellets in these sizes: No. 7 1/2 – 350; No. 6 – 225; No. 5 – 170. Depending somewhat on choke constrictions (which account for much less variance in number of pellet strikes than you might think, given all the hullabaloo about six or eight different graduations of choke tubes available), the odds that six or more pellets will strike the bird at distances beyond 30 yards are poor with shot size No. 5. Lesson 2: The depth of penetration of a shot pellet is determined by its mass. Size does matter. A pellet of No. 6 shot that strikes the bird between the distances of 25-30 yards at about a 45 degree angle will penetrate from a depth of 1/2 inch to a depth of 1 1/2 inch, depending on whether the pellet strikes soft tissue or bone. A pellet of No. 7 1/2 shot will penetrate less deeply; a pellet of No. 5 shot will penetrate more deeply. Pellet penetration will decrease significantly as distance to the target increases. Penetration is also greater for sharp-angle (broadside) strikes than for shallow angle (straightaway) strikes. A pellet of any size that penetrates 1/2 inch or more will inflict significant damage. Six or more such pellet strikes will almost certainly bring down the bird, although it will not necessarily be killed by those strikes. The odds are poor that a No. 7 1/2 shot pellet will penetrate 1/2 inch on a pheasant shot at 30 yards or greater distance. Lesson 3: Penetration also depends on the hardness of the shot pellet – the amount of antimony alloyed with the lead. Antimony is an expensive element. Inexpensive shotshells are cheap because they are loaded with shot that has low antimony content: soft shot. My pheasant autopsies show that shot from cheap factory loads penetrates poorly, sometimes barely piercing the feathers and skin of the bird. The same is true of the lower-priced shot that can be purchased for custom loading. Copper-coated or nickel-coated shot penetrates deeper than uncoated shot only if the coated shot has a high percentage of antimony and is therefore very hard even before it is coated. The best quality coated shot is no harder than the best quality uncoated shot, and the difference in penetration depth on birds is slight. Lesson 4: Muzzle velocity of a shot load does not much affect pellet penetration. The slowest loads start at about 1,200 feet per second, the fastest at about 1,400. Due to the poor ballistic properties of round lead pellets, they are all traveling about 900-1,000 fps by the time they strike a target 30 yards distant. I have killed pheasants with loads ranging in velocity from 1,150 fps to 1,350 fps, custom loaded and measured with my chrony. Inspecting birds killed, I could not find consistent difference in the penetration and damage caused by pellets of the “slow” loads compared to the “fast” loads – if pellet size and hardness are the same. Lesson 5: Winter plumage is a misconception. Although they look thick-coated as bears when they fluff themselves out in the sunshine on a cold winter day, my pheasant autopsies indicate they do not put on additional plumage in the late season. Feathers hinder shot penetration no more on the last day of the season than on the first. However, some well-fed birds do put on more subcutaneous fat as the season progresses and this does reduce pellet penetration. Lesson 6: The pheasant hunter’s conundrum. If we choose No. 7 1/2 shot there is greater likelihood that several pellets will strike, but beyond 30 yards those pellet strikes may not penetrate the half inch or more required to inflict lethal wounds. If we chose No. 5 shot there is greater likelihood that a pellet strike will cause lethal damage, but beyond 30 yards there may not be enough pellet strikes to immediately fell the bird. Most shooters are poor judges of distances. I learned this on my clay target range where we shoot at 90-degree crossing targets. Visiting shooters note that they have trouble hitting these targets, which they judge to be 35-40 yards distant. The actual distance is 22 yards. Afield, my observation is that it is rare indeed for a pheasant to be shot at distances beyond 40 yards, and rarer still for one to be felled. Most killing shots are less than 30 yards, many less than 25 – even late in the season. The overall lesson: My game bird autopsies have taught me that the best load for pheasants is one ounce of the hardest No. 6 shot, loaded in 2 3/4-inch 20 gauge hulls, 1,200 foot-per-second muzzle velocity. Late in the season I switch to No. 5 shot, although I doubt it is any more effective. I have chosen to shoot these loads because they always knock down and frequently kill the pheasants I hit and they pattern well in both the improved-cylinder and modified barrels of my 20 gauge double gun. Most important, I shoot this gun better in the field than any of my others, in part because it is light and I do not get arm weary and shoot poorly, hitting birds with the fringe of the pattern. So after all this research, my pheasant shotshell load decisions are based more on the shotgun than the ammunition. And, scientifically speaking, that is my recommendation for you, too. You wanted a new double gun anyway, right? More stories about upland bird hunting are published in my collection of essays, Crazy Old Coot, and my novel, Hunting Birds. Both are available in Kindle and paperback editions at Amazon.com. 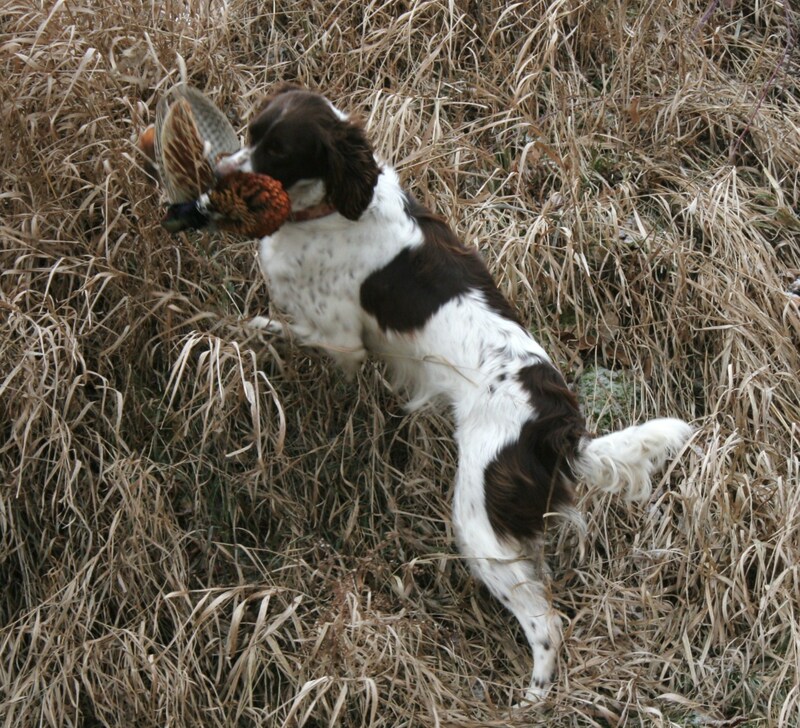 This entry was posted in Bird hunting, Shotguns and tagged bird dogs, bird hunting, shotguns. Bookmark the permalink.